While I let the random number generator determine what videos I would write about for Sridevipalooz, I did not let it stop me from being tempted by youtube's suggested links and setting aside a few goodies for later. See if your jaw drops at the same spot mine did. 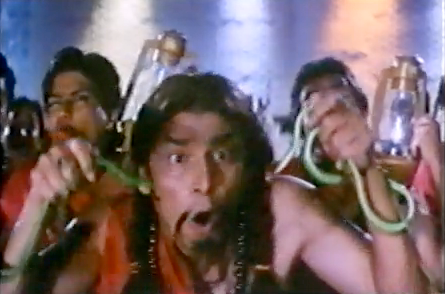 While Sridevi's gold chain tiara is quite awesome, what I really love - and found pleasantly surprising - about this song are its dollar store accessories used to such pretty effect. Crepe paper streamers and feather dusters - I don't know if these are actually feather dusters, but that's what keeps coming to mind - provide such colorful billowing swooshiness (note the soft-focus effect at the beginning) and the synthesizers that kick in with the big spirals at around 3:30 are a perfect match. It's like a really good Project Runway-style challenge: "make a six-minute song sequence with only this hill, three pairs of tight jeans, moves learned in middle school PE classes, and the contents of this discount bin." 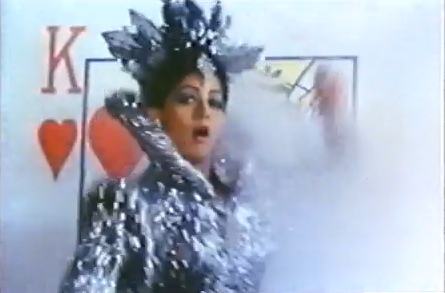 Oh, and Sridevi's outfit at the beginning is just so...what is that, Princess Di? Angela from Who's the Boss? I love it. Earlier in Sridevipalooza, Bollystalgia wondered if part of her own fondness for Sridevi is due to her outfits, and that's definitely a factor for me here. I mean, look at her. She's a sparkly rainbow with a boa and blue tights. My inner four-year-old is squealing so loudly I can hear her all the way from thirty-six. Not only does Sridevi look amazing, she is behaving outrageously at a party full of tight-lipped adults and getting away with it. Part of the curious Bollywood fashion time warp it may be, but her turquoise and gold ensemble, complete with braided headband and fluffy curls, also pleases my inner child. As for the wedding dress...well, see for yourself. Also, that black and white sofa is beyond unbelievable. Samrat, who sent me this clip, told me that this is an epic dance-off not only on the screen and in the story but also in design, with different choreographers creating Sridevi's and Amitabh's steps. Even more impressive to me is the sheer attitude. I've seen more than enough Amitabh films to expect him to be able to stare and smirk and insinuate his way through a scene very effectively, and I was thrilled to see a woman match him glare for glare. And the look of the whole thing is impressive and evocative. It's amazing what you can accomplish with miles of heavy fabric, a chunky belt, and eyeliner. The addition of a sword or dozen doesn't hurt, either. 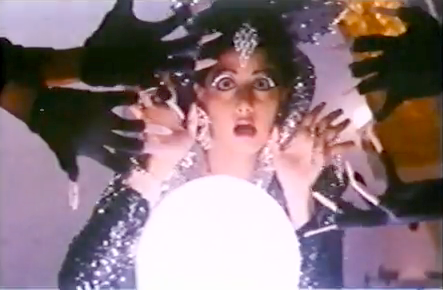 5) Sridevi's look: evil fortune-telling queen of the steel wool pot scrubbers? 6) Villain lair with smoke machine and playing-card door. 7) Special lighting that seems to affect only Sridevi. As is only right and proper. 8) Guy in disguise dancing along. 9) Integrative approach to percussion and electric guitars. Beth - I LOVE THIS POST!!!!! OMG, thanks for reminding me of the Aiyyayo song from Guru! And yes, Sridevi definitely had the 80s elementary school dream wardrobe - she of the puffed sleeves and flouncy skirts and sequins, not to mention various pigtailed/braided/curled/crimped/etc. hairstyles. She was like a life-size Barbie doll that I wanted to love and hug and name George. Incidentally, I ADORE Mein Aisi Cheez Nahin from Khuda Gawah, one of my absolute faves. My heart about stopped in the theatre when I saw this one. Two of my top faves performing together!! The Jhumma Chumma Live in London tour was also the source of a lot of squees from me. Amaluu - YAY! :) I had a ton of fun doing it - the whole project too, of course! I've learned a lot and have several additions to my "watch someday" pile (definitely including Khuda Gawah - did they do many films together? They seem like such a strong pair). I've also gained some appreciation for aspects of 80s films generally, which is no small feat. Srikant - YAY! :) (I shouldn't repeat myself, I guess, but the situation demands it! :) ) The clip you sent is quite something - that's a doozy of a compilation of shakes :) Don't you love it when filimmakers clearly recognize what their audience wants and serves it up with a good sense of humor? Her big winks in that sequence are so cute too. I haven't, but I'm pretty sure I need to too!